From the Sloan Management Review comes a remarkable collection of articles written by highly regarded experts in the field of e-business. This second book in the MIT SMR series is aimed at those seeking to integrate e-business into their enterprises as a way of maintaining -- or establishing -- competitive advantage. 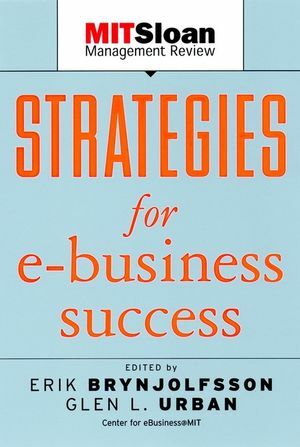 Strategies for E-Business Success offers a roadmap of the fundamental principles and tools executives need. Erik Brynjolfsson and Glen L. Urban are codirectors of the Center for eBusiness at the Massachusetts Institute of Technology and professors at the MIT Sloan School of Business in Cambridge, Massachusetts. Introduction (Erik Brynjolfsson and Glen L. Urban, Editors). 1. Finding Sustainable Profitability in Electronic Commerce (John M. de Figueiredo). While many e-commerce retailers head toward commodity pricing, there are a few that are likely to profit on the Web. Only retailers who match market segment to correct strategy will win. Here's how. 2. Making Business Sense of the E-Opportunity (David Feeny). New Web technologies are offering companies unprecedented opportunities to rethink strategic business models, processes, and relationships. 3. Profits and the Internet: Seven Misconceptions (Subramanian Rangan and Ron Adner). Managers aiming to capitalize on the Internet to achieve growth need to understand the full implications of the strategies they choose. 4. Five Steps to a Dot-Com Strategy: How to Find Your Footing on the Web (N. Venkatraman). Vision, governance, resources, infrastructure, and alignment are the stepping stones to a successful Web strategy. Building on your current operations, experimenting with new approaches, and creating new business models all play a part. 5. Pathways to E-Business Leadership: Getting from Bricks to Clicks (Leslie P. Willcocks and Robert Plant). How do leading business-to-consumer corporations harness the Internet to acquire new customers and increase their market share? A new study of fifty-eight companies describes several strategies that work. 6. The Past and Future of Competitive Advantage (Clayton M. Christensen). Today's competitive advantage may become tomorrow's albatross unless strategists attune themselves to changes in underlying conditions. 7. Placing Trust at the Center of Your Internet Strategy (Glen L. Urban, Fareena Sultan, and William J. Qualls). Consumers make Internet buying decisions on the basis of trust. How much trust your Web site needs to deliver depends on the nature of your products, competitive pressure from new infomediaries, and your ability to innovate. 8. How Do They Know Their Customers So Well? (Thomas H. Davenport, Jeanne G. Harris, and Ajay K. Kohli). Insightful companies mix rich customer data with their understanding of the people behind the transaction. 9. Building Stronger Brands Through On-Line Communities (Gil McWilliam). Consumer brand companies need new management skills, and brand managers must understand on-line behavior if they wish to develop strong, sustainable, and beneficial on-line communities around their brands. 10. Four Smart Ways to Run On-Line Communities (Ruth L. Williams and Joseph Cothrel). Kaiser Permanente, About.com, Sun Microsystems, and Ford have created four kinds of innovative on-line communities. Their experience shows not only how to manage communities, but also how to manage today's workforce. 11. Product-Development Practices That Work: How Internet Companies Build Software (Alan MacCormack). Now there is proof that the evolutionary approach to software development results in a speedier process and higher-quality products. 12. What Makes a Virtual Organization Work? (M. Lynne Markus, Brook Manville, and Carole E. Agres). Today's workforce increasingly consists of de facto volunteers. The open-source software movement-propelled in large part by volunteer programmers-suggests ways to motivate and direct knowledge workers.